Do cyclones develop ‘off-season’ in the Atlantic? In the Atlantic, the official dates for the hurricane season are 1 June – 30 November. This certainly doesn’t mean that cyclones only exist during this time frame, yet 97% of all cyclones that have developed have occurred during those months. While we really won’t know exactly how many cyclones have developed out of season prior to 20th century technological advances, there is evidence of off-season storms in the Atlantic dating back to May of 1771, and more recently tropical storm Beryl in May of 2012. Most cyclones that develop out of season do not typically impact the U.S., but there have been more than handful that have, giving us pause to think what a fickle planet our Earth can be. Typhoon Fengshen was the strongest storm of the 2002 Pacific typhoon season. It developed on July 13 near the Marshall Islands and rapidly intensified due to its small size. Fengshen went from being a tropical depression to a cyclone in only 6 hours. By July 15, Fengshen was given typhoon status, and after initially moving to the north, it turned toward the northwest. On July 18, the typhoon reached its peak intensity of 185 km/h (115 mph), according to the Japan Meteorological Agency; the Joint Typhoon Warning Center (JTWC) estimated peak winds of 270 km/h (165 mph). Disparities like this between agencies are the driving force behind the creation/purpose of Cyclone Center, and with your help these dissimilarities can be smoothed out. Your classifications are important to us, so we ask that you please take a moment and provide your input on Typhoon Fengshen to help us determine its peak winds. The JTWC estimated that Fengshen was a super typhoon for five days, which broke the record for longest duration at that intensity. 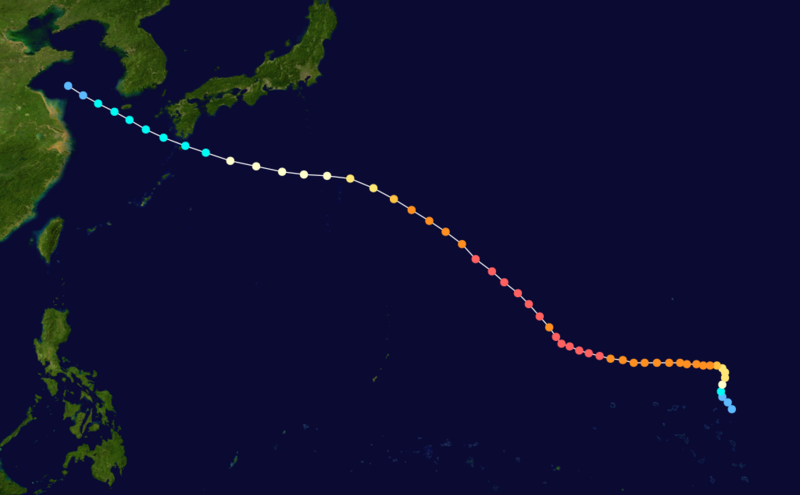 This record would later be tied by Typhoon Ioke in 2006. While approaching peak intensity, Typhoon Fengshen underwent the Fujiwhara effect with Typhoon Fung-wong, causing the latter storm to loop to its south. 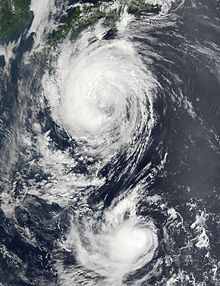 The Fujiwhara effect is when two nearby cyclonic vortices orbit each other and close the distance between the circulations of their corresponding low-pressure areas. Interaction of smaller circulations can cause the development of a larger cyclone, or cause two cyclones to merge into one. Fengshen gradually weakened while approaching Japan, and it crossed over the country’s Ōsumi Islands on July 25 as a severe tropical storm. The typhoon swept a freighter ashore, killing four of the 19 crew members aboard. In Japan, Fengshen dropped heavy rainfall that caused mudslides and left $4 million (¥475 million Japanese Yen) in crop damage. After affecting Japan, Fengshen weakened in the Yellow Sea to a tropical depression, before moving across China’s Shandong Peninsula and dissipating on July 28. The typhoon produced strong winds and heavy rain in Japan. A station in Miyazaki Prefecture reported the highest rainfall in Japan with a total of 717 mm (28.2 in). Most of the precipitation fell in a 24 hour period, and the heaviest 1 hour total was 52 mm (2.0 in) in Taira, Toyama. The remnants of Fengshen produced heavy rainfall in northeastern China. The storm affected the capital city of Beijing, becoming the first storm to produce significant impact there since Typhoon Rita in 1972. – Kyle Gayan is an undergraduate student in Atmospheric Sciences at the University of North Carolina at Asheville and is also a retired USAF Master Sergeant; his 20 years of service was spent exclusively in the weather career field. He recently joined the Cyclone Center team as a classifier and contributor to our social media.